With the smash sensations March of the Penguins, Happy Feet and Surf's Up, it's no surprise that the popularity of penguin costumes has increased dramatically. Probably at no point in history has it been so "cool" to be a penguin! When deciding what kind of a costume to be for Halloween, this is an excellent choice. Depending on which expert you talk to, there are an estimated 17 to 20 species of penguins living in the Southern Hemisphere. Lacking the ability to fly, these black and white birds swim amazingly well, averaging 4 to 8 mph underwater. They eat fish, krill, squid and other forms of sea-faring animals. Their black and white feathers act to disguise them when swimming. Their white stomachs help them blend in with reflections from the water's surface when seen by a predator from below. Their black feathers help hide them when seen from above. Besides their black and white coloring, one thing that distinguishes them from other birds is their distinct waddle. Another form of movement they use to move across the snow is called "tobogganing." This is where they slide on the snow on their bellies. There are a lot of options for penguin costumes. Many costume shops carry detailed and very basic costumes for both children and adults. Some actually feature a hood or head covering. Some require face painting for the full effect. If you're not in the market to purchase a costume, one can be made relatively easily. Of course, the costume can be basic or it can be more deluxe. For a deluxe costume that is made from a pattern, get the Simplicity pattern 3639. The pattern is available in a variety of sizes from children's extra-small to large, and adult sizes from extra-small to extra-large. The costume can be made from either fleece or flannel, and features Velcro closures and elastic to make the costume fit. Padding is added to the costume utilizing polyester fiberfill. If you're looking for an already made, ready-to-go costume, the Full Penguin Costume might be just what you need to purchase. Available for under $40 for an adult, it does come in children's and toddler sizes, too. The costume is fabricated of Poly-Foam. Unlike some costumes, this one features the penguin body, a headpiece and shoe covers. The details of the costume recommend that any open parts of the costume be stuffed with something for padding. Newsprint, tissue paper or polyester fiberfill would work perfectly for this. 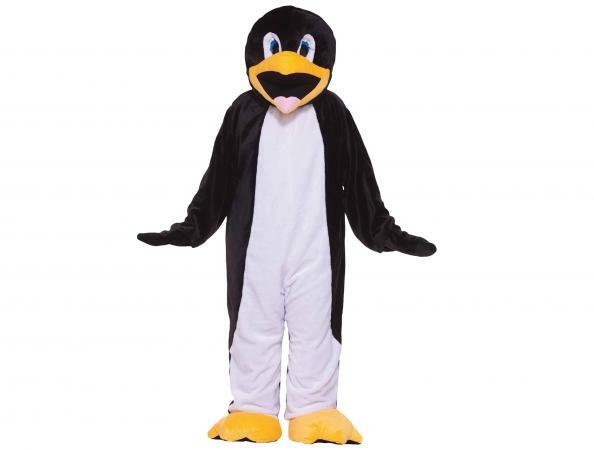 Maybe you're considering a penguin costume that is really unique and will get you noticed. Select a penguin mascot costume. These are a little pricey, over $1,000, but feature great detail. There is a head to each costume (not just a head cover), and each costume arrives already stuffed and ready to go. Regardless of how good your penguin costume is, it really isn't convincing unless you characterize your walk as that of a penguin. The distinctive waddle of a penguin is necessary to really pull off this costume. A certain amount of practice may be required with the costume both on and off. Waddling may be, at first, a bit awkward. However, the practice will pay off in the form of compliments. A number of accessories can be added to this costume. Perhaps, you'd like for your penguin to be wearing a top hat and carrying a cane. Maybe there is a theme to the party that your penguin costume can match. If it's a "country" party; your penguin could wear a bandana and a cowboy hat. A bow tie is always in fashion for a penguin. With a little imagination, there are limitless possibilities for accessories. Since so much media attention has been focused on penguins the past couple of years, a penguin costume is sure to be a hit at any party. The traditional black and white of a penguin is always in style. There is something charming and, almost, formal about a penguin and its waddle.